Fully managed, cloud service that enables you to move your mission-critical workloads and applications to the cloud, and manage them with ease. 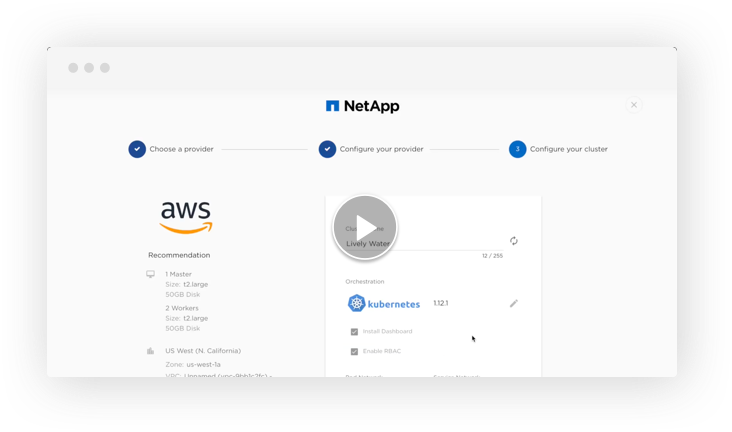 NetApp configures and manages your infrastructure so you don‘t have to. With consistently high performance, over 200k IOPS, Cloud Volumes Service provides shared persistent storage with high throughput and low latency that meets the demands of large databases and HPC applications, like: Software builds, Genomic sequencing, Video rendering and transcoding, EDA, Financial simulation models, Oil and gas 3D modeling and Fluid dynamics. Cloud Volumes Service for AWS delivers fully-managed file services for both NFS, SMB, or dual protocol support. Move NFSv3 and SMB workloads to the cloud without refactoring. No need to manage Windows or Linux servers just to provide file services. To process, store, and analyze massive amounts of data, your shared file service needs lightning-fast, highly reliable storage solutions. Cloud Volumes Services for AWS is up to the challenge. It enables running HPC workloads in the cloud that benefits from elastic computing. This can be far less expensive than running on-prem and takes significantly fewer resources. After failing to meet their performance goals with self-managed, cloud-based NFS servers and cloud-native file share services, WuXi NextCODE found that only Cloud Volumes Service delivered the performance they needed to optimize their use of massive genomic data. With Cloud Volumes Service they can rapidly integrate data on-the-fly to deliver unprecedented computational efficiency to their customers. NetApp Cloud Volumes Service was compared against alternative cloud services. It successfully completed tests that the other services were unable to run without timeouts or failures. Simplified migration of NAS applications because no refactoring is required. Cloud Volumes Service for AWS provides scalable, highly available, high performance SMB shares with snapshots and full integration with Active Directory (standard and AWS managed). CVS supports SMB 2.1, 3.0 and 3.1.1 which enables all Windows versions in AWS to leverage CVS. A software development firm wanted to migrate its Windows-based application to the cloud, but found that a lack of support for SMBv3 required them to either refactor their data or build their own SMB shared storage and file service solution. Upon deciding to build their own, they quicky found that the undertaking required additional resources and personnel that strained their budget. They tested Cloud Volumes Service because it provided a solution for cloud based shared storage for Windows Server without all the overhead and administration involved in a build-your-own solution. They were able to free up engineers and resources to speed up their development cycle and get their software to market faster. Easy migration of Windows applications and users because no refactoring was required. Saved money by no longer needing to maintain servers on-premises. Reduced complexity of supporting SMBv3 in the cloud by providing an alternative to creating and managing their own cloud-based Windows storage server or a Samba server. We always had some time outs or some file failures, but when we tested this using NetApp Cloud Volumes, it actually finished in less than an hour. That was a great breakthrough for us. We love how NetApp has invested, leaning forward into the cloud, so that we can enable our customer’s success. Subscription (monthly, annual) starting at 1TB or any TB quantity you desire. Choose the performance level that best suits your application requirements and adjust on-the-fly... without having to move your data. Cloud Backup Service is an integrated add-on feature for Cloud Volumes Service. To protect your data, it delivers fully managed backup and restores capabilities and a long-term archive of your cloud data. Cloud Volumes Service for AWS is a fast, highly available and enormously scalable platform for creating cloud-based NFS and SMB file systems for UNIX and Windows platforms. Cloud Sync – Cloud Sync is NetApp’s service for rapid and secure data synchronization. 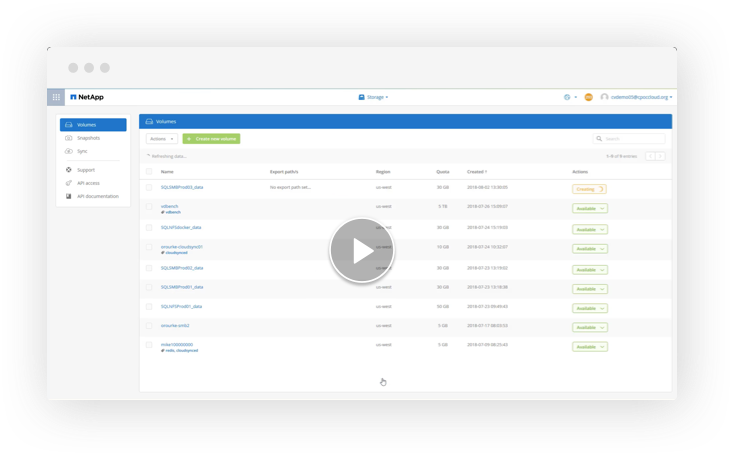 Whether you need to transfer files between on-premises file shares and Cloud Volumes Service for AWS or between Cloud Volumes in different regions, Cloud Sync copies the files where you need them quickly and securely. Cloud Sync is integrated and included for free with Cloud Volumes Service for AWS. SnapShot Copies – Our zero-footprint snapshot copies don‘t cost you additional cloud data capacity. You can run Snapshots manually or on a set schedule. Rapid Clones – Create new copies of datasets based on a clone of a point-in-time snapshot copy. Data Encryption – All data at rest is encrypted by default, so your data is always protected. Is Cloud Volumes Service for AWS the Fastest Storage?